How many Units (800 gram)? The best breakfast or meal replacement - Bar None! Best Taste! Premium Quality! Designed with the care for your health by Chiropractic and Naturopathic Doctors, Nutritionists and other Health Care Practitioners. This product contains no artificial flavors or sweeteners. In 420 B.C., Hippocrates, known as the 'Father of Medicine', recommended the health-boosting benefits of whey. In Europe during the Middle Ages, whey was touted as a health tonic. Fast forward to the 21st Century, and we have scientists discovering an amazing array of healthful benefits from whey. Pasture grazed cows have 500% more CLA in their milk than cows fed silage. Breakfast. Sets the pace for the day! Professional car racers can only keep the pace if their fuel is absolutely correct. The same applies for us! In our 'got-to-go' society, the trend has been to skip breakfast and 'grab something on the run' which more and more has become coffee and a muffin or other sweet pastry, and give the kids some sort of starch and sugar in a box with low fat milk. This 'habit' has definitely helped fuel the Diabetic and Obesity epidemic throughout North America not to mention the 'always hungry and tired feelings' we have throughout the day. Two hormones, insulin and leptin are now clearly at the center of discussion and need to be understood in order to get this epidemic under control. Hormones are chemical messengers that direct, orchestrate and regulate all your body's activities. Insulin is such an important hormone that without it, cells would stop allowing glucose (your energy molecule) from entering through the cell membrane and be metabolized for energy production. Diabetics know this only too well, but so do top athletes who strive to achieve enhanced performance. Leptin on the other hand is a hormone, produced by your fat cells. It tells your brain when you should eat, how much and WHEN to stop. It also has other critical functions such as regulating blood circulation, preventing blood clots, enhancing new bone growth, regulating body temperature and cell reproduction to name but a few. When the body's levels of both are too high, you have serious problems with sugar and fat metabolism, which commonly leads to diabetes and obesity if left unchecked. The culprit is progressive Insulin and Leptin Resistance. In Insulin Resistance, the body's sugar levels progressively increase in an attempt to trick the cell in absorbing more glucose, because elevated insulin levels gradually slow the process down. It leads to a vicious circle of hyper and hypoglycemic events and eventually to many degenerative diseases including but not limited to diabetes, heart disease and cancer. In Leptin Resistance, your body's 'fat burning' slows down, giving rise to sweet cravings and more fat storage. This in turn leads to the same degenerative diseases as insulin resistance. Look at it this way, the more your inadequate diet triggers high levels of Insulin or Leptin, the more your body gets 'tired' of the constant demand (nagging) for sugar and the more your insulin just stops 'listening' and shuts down it's receptors (preventing absorption into the cell). This is 'Resistance'. Sound a lot like a nagging spouse syndrome doesn't it. Both hormones are 'regulators' and as such should not be inhibited by drugs lest you want a whole lot of side effects. For the majority of people, the only sensible way for these two to return to normal is to adopt dietary changes. Start your day with a high fiber, low complex carbohydrate, low glycemic, high quality protein breakfast (such as a NaturePro smoothie) with plenty of good Omega 3 oils. This keeps insulin and leptin levels low and triggers fat burning. My Morning 'Power' Smoothie to the rescue! I successfully start my day with a simple, easy and inexpensive recipe, which provides me with all essential amino acids, vitamins and minerals and essential fatty acids to carry me well through the day. It has eliminated morning sugar cravings and fatigue and provided the much needed energy and normal weight, which we all strive for. It's also one of many proactive things I do to prevent degenerative diseases and insure longevity. See my recipe in the tab labelled 'Recipes'. Medicinal Ingredients: Whey Protein concentrate 20 g, L-Lysine 1750 mg, L-Aspartic acid 450 mg, Vitamin C (Sodium Ascorbate) 350 mg, Vitamin D3 (Cholecalciferol) 10 μg or 400 IU, Vitamin E (d-alpha tocopheryl acetate) 163 mg AT or 350 IU, Calcium (Di-Calcium Phosphate) 60 mg, Potassium (Potassium Gluconate) 50 mg, Phosphorous (Di-Calcium Phosphate) 51 mg, Magnesium (Magnesium Citrate) 30 mg, Zinc (Zinc Citrate) 25 mg, Thiamine (Vitamin B1) 10 mg, Riboflavin (Vitamin B2) 7.5 mg, Manganese (Amino Acid Chelate) 7.5 mg, Niacin (Niacinamide) 3 mg, Vitamin B12 (Cyanocobalamin) 500 mcg, Iron (Amino Acid Chelate) 2.5 mg, Folic acid 1000 mcg, Biotin 500 mcg, Vitamin A (Palmitate) 300 mcg or 1000 IU, Vitamin A (Beta-carotene) 600 mcg or 1000 IU, Selenium (Sodium Selenite) 100 mcg, Chromium (Amino Acid Chelate) 37.5 mcg. Non-Medicinal Ingredients: Chicory root extract, L-Glutamine, Glucosamine Sulfate, natural vanilla flavor or natural chocolate flavor (NaturePro Chocolate only), stevia leaf powder, sea salt. Customers report success with blood sugar control, weight loss, acid reflux relief, improved immune system (less sick days), improved joint flexibility, more energy, healthier hair, smoother skin, less sugar cravings, quicker recovery after workouts, muscle tone, less aches and pains, even cholesterol and blood pressure improvements. Caution: If you have a medical condition or are taking prescription medicines, consult your physician or health care professional before taking this product. Avoid using two (2) hours before or four (4) hours after taking other medications. Folate supplementation can mask a vitamin B12 deficiency. Consult a health care practitioner prior to use if you have impaired liver function. Discontinue use if you experience a prolonged flushing, burning, tingling or itching sensation on the face, arms or chest. Consult a health care practitioner prior to use if you have a history of non-melanoma skin cancer. Zinc supplementation can cause a copper deficiency. Consult a health care practitioner if you are unsure whether or not you are taking adequate copper. Do not use if you are pregnant or breastfeeding. Do not use if seal is broken. Store in a cool, dry place. Disclaimer : The statements regarding these products have not been evaluated by the Food and Drug Administration or any other regulatory entity. These products are not intended to diagnose, treat, cure or prevent any disease. The information on this Web site or in emails is designed for educational purposes only. It is not intended to be a substitute for informed medical advice or care. You should not use this information to diagnose or treat any health problems or illnesses without consulting your physician. Please consult a doctor with any questions or concerns you might have regarding your condition. To find a naturopathic doctor in Canada or the United States click on the respective country. This mixture will keep you feeling fuller longer while assisting you to minimize or eliminate cravings and overeating because blood glucose levels are optimized and your body is better nourished. While not guaranteed, it is reasonable to conclude that you will experience improvements, as many have, in mood, energy, cognitive skills, memory, concentration, stress management, performance, weight management and overall health. 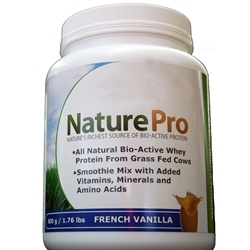 NaturePro is also great for nourishment and recovery after exercise or physical exertion (research indicates that protein consumed within 30 to 120 minutes after exercise while avoiding 'high glycemic' foods and drinks provides optimal benefits). Great for the whole family including children! 1 to 2 cups of fresh or frozen low glycemic berries such as Blueberries, Saskatoons, Blackberries, Raspberries, Strawberries. A mixture of the different berries is great! Using a good blender, add in all of the ingredients except the NaturePro and Greens Powder. Blend / liqufy until you get a smooth well blended mixture. Caution: never attempt to assist the blending / liqufying process while blender is running! Once desired mixture consistency is achieved, stop blender. Add in the Greens Powder and NaturePro protein and bump-blend the mixture never allowing the blender to run anymore than a couple of seconds in order to prevent damaging the fragile protein structures. Enjoy your "Body Charge" Smoothie! If in a hurry or choosing to consume later, place smoothie in a air tight container (preferably glass) and keep cool to minimize oxidization and degradation of the smoothie. It should be good for a few hours. While consuming the smoothie, utilize a bit of a "chewing" motion to ensure necessary digestive enzymes are introduced into the mixture as it passes through the mouth. Feel free to experiment with different ingredients in order to have some variety if you so choose. Always keep your smoothie "low glycemic"
If you are allergic to any of the ingredients mentioned or to anything you may consider adding to your smoothie, please avoid using or consuming them. If you are pregnant, nursing, taking medication, or have a medical condition, consult your physician before using any of these products. Please consult a doctor or health care practitioner with any questions or concerns you might have regarding your condition.